Solar radiation constantly bombards Earth, and Earth’s magnetic field repels it. According to a new study, our planet’s protective shield might weaken far more quickly and unpredictably than scientists previously thought. Like the invisible force shield around the Death Star, Earth's magnetic field surrounds and protects our planet from the hottest, most statically charged particles the sun can throw our way. This shield — the natural product of molten iron swirling around the planet's core — has had our backs for billions of years, and prevented Earth from becoming an irradiated, electrified wasteland. Every now and then, though, that shield lets down its guard. Luckily, full reversals are uncommon and unfold slowly over thousands of years. (The last full reversal occurred about 780,000 years ago.) But according to a new study published Monday (Aug. 20) in the journal Proceedings of the National Academy of Sciences, partial or temporary shifts in Earth's magnetic poles can occur much, much faster than was previously thought possible — potentially, within a single human lifetime. In the new study, an international team of scientists analyzed 16,000 years of geomagnetic history coded into the atoms of an ancient stalagmite in China. This story written in stone told them that once, about 98,000 years ago, the planet's magnetic field suddenly flipped polarity in as little as 100 years — roughly 30 times faster than the generally expected rate, and 10 times faster than what was thought to be the fastest rate possible. "The record provides important insights into ancient magnetic field behavior, which has turned out to vary much more rapidly than previously thought," study co-author Andrew Roberts, a professor of Earth sciences at Australian National University, said in a statement. The team found that Earth's magnetic polarity shifted several times during that 16,000-year period, which was no surprise to them. The shock emerged about 98,000 years ago, when a huge shift in polarity occurred in a period of less than 200 years — possibly within 100 years. "Such an extremely rapid polarity drift has not been shown before," the researchers wrote in their new study. Knowing that our planet is capable of such spontaneous magnetic tantrums is important, mainly because our magnetic shield can diminish to about 10-percent effectiveness when it's in the middle of a reversal. Fortunately, that weakening isn't enough to threaten life on Earth; after all, Roberts pointed out, the planet's magnetic field has been reversing periodically for billions of years, and life still persists. Human technology, on the other hand, might have a rougher time coping. Solar weather events, such as solar flares and solar wind storms, occur when blazing-hot, supercharged particles of energy blast out of the sun's surface and whiz across space on a collision course toward Earth. 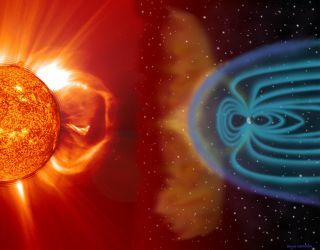 Even when our planet's magnetic field is at its strongest, a powerful enough solar storm can rip right past those defenses and wreak havoc on anything electrical. That surge of charged particles can garble radio signals, fry satellite and spacecraft instruments, and overload circuit breakers to take down entire power grids. That's exactly what happened on March 13, 1989, when a massive solar storm crackled through the atmosphere and knocked the power out in Quebec, Canada, for 9 hours. An earlier, even larger solar storm in 1859, known as the Carrington event, reportedly caused telegraph wires to short-circuit all around the United States, throwing off sparks that started fires and electrocuted office workers. Storms far less powerful than these could cause much more damage if they happened to hit while Earth's magnetic field was in the midst of a reversal, Roberts said. The result would likely be trillions of dollars in damage to our electrical infrastructure, and right now, there's no plan for dealing with an event of that magnitude. "Hopefully, such an event is a long way in the future and we can develop future technologies to avoid huge damage," Roberts concluded. Keep your fingers (but not your magnetic-field lines) crossed.